Since my last write-up around a year ago, I have been searching for the best places to eat in Nottingham and sometimes in various places around the UK. I have eaten at a wide range of places from fine dining restaurants and delis to cafes and street food vendors. Now I am trying to make use of my greed and gluten when it comes to food to summarise what different places offer, what the overall experience is and to highlight some of the little gems that may often get overlooked, especially in a city such as Nottingham where there is a myriad of choice when it comes to food. Set in the architecturally stunning Lace Market, Nottingham, Aurora Restaurant can be found on Plumptre Street just off of Stoney Street. Aurora is tucked away and could be easily missed by the casual passer-by. The entrance to the restaurant is through a doorway and then a flight of stone steps down to the basement where the restaurant is housed. Although underground the restaurant is very light and airy. It is a very modest size the layout of the seating is very spacious. The restaurant has a very rustic feel with exposed bricks along the walls and paving on the floor. This helps to create a unique feel to the place and offers something different in terms of its feel and design compared to the commercialised chains that can often lack character. I went for three courses which cost £24.95 as I went in the evening. Two courses would have cost £19.95. Whilst I was deciding what to have I ordered an appetiser of char-grilled pitta bread that was served with tzatziki and hummus. The pitta bread was nice, warm and grilled perfectly, as this made it slightly more robust for dipping. The tzatziki was mild and refreshing, with added flavour and freshness that was provided by the dill, turmeric and cubes of cucumber. The hummus was delicious with the addition of sliced red onion that added extra flavour and a good variation to the dip. It was also a good consistency and not too oily, as some places can often ruin it by doing so. Our appetiser cam quickly and the service was very attentive and friendly throughout our meal, adding to the overall quality of the meal and evening that we had at Aurora. To start I went for the smoked and seared duck with chicory, beetroot and pomegranate seeds. The starter arrived quickly and the service was both prompt and polite. I felt that the dish offered a good contrast between the two styles of duck and was well presented. The first was a mix of chunks of duck that was complimented with spring onion, the latter being thinly cut slices of duck that was also very tasty. Fresh and crispy lettuce, beetroot and pickled shallots made this dish both colourful and refreshing along with the added sweet crunch that the scattered pomegranate seeds added. Overall, I felt that the starter was well presented and prepared using good quality ingredients. For my main course I opted for Thai style coconut chicken, udon noodles, chilli, ginger and lime leaf. Although this dish had less colour to it, it was still well presented and the portion size was good. The dish consisted of two chunky pieces of chicken on the bone that sat on top of the noodles and a broth that was flavoured with a Thai influence. The udon noodles, a thick flour noodle most commonly used in Japanese cooking, worked well with the dish. Further to this, the coconut taste was nice and was seasoned with the addition of chilli, red onion and spring onion. The chicken itself was well cooked and not dry. For my dessert I chose the hazelnut chocolate pana cotta and orange textures. The dessert was topped with segments of orange that complimented the smooth, thick and creamy panna cotta. The dish was complimented by a small bowl of ice cream that was topped with a fresh mint leaf. The dish was artistically presented with sliced fresh strawberries and swirls of raspberry coulis dotted around the dish. Overall I felt that the dish was well flavoured and contained an aesthetic arrangement of fresh fruit. Overall, I feel that Aurora offers great value for money. The place has a nice ambience with attentive staff, not to mention the superb quality of the food and the exquisite presentation of each and every dish. This venue is the perfect place for a special occasion, romantic meal or work party/night out. The food is reasonably priced and three courses can cost as little as £19.95 on their lunch menu. Alongside this they also offer a Sunday roast as part of a three course meal on Sundays for £20. At lunch they offer a bistro style menu, from which three courses can be selected for only £11.95. 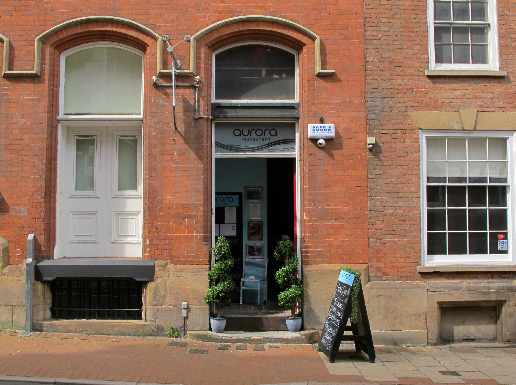 Location: Aurora Restaurant is located in the Lace Market area of Nottingham, Plumptre Street, Nottingham, NG1 1LX.